The Nerdy Teacher LLC is an educational consulting business focused on supporting school districts, educational conferences, and EdTech businesses. The Nerdy Teacher LLC is run by Nicholas Provenzano. He is an award winning educator and best selling author who has travelled the world promoting best practices in education. He has been featured on CNN, Education Week, The New York Times, and other media outlets. He has presented internationally at conferences and worked closely with educators around the world to support their educational goals. 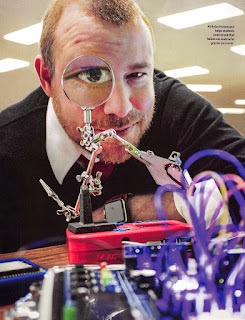 He is a Google Certified Innovator, Raspberry Pi Certified Educator, TED Ed Innovative Educator, littleBits Educational Ambassador and holds other certifications with other companies. Nick has recently presented workshops on Coding and Makerspaces in Sauðárkrókur, Iceland. Here are some photos from his time there and check out the website. Here is a News Interview I did in Iceland. You can catch me at the 6:30 mark. I have had the pleasure of working with teachers from Singapore to Iceland and all across the country. One of the things that stands out to me is that it doesn't matter where you teach, educators are ready to learn and share to support learning of their colleagues and themselves. If you are looking to make a change in your school culture or kick off the conference with some positive energy, consider contacting me as we can make something amazing happen. Here are just a few of the sessions I can present on at a conference. Many of these can be presented in workshop form as well. Project Based Learning: Empowering Student Learning - This session will focus on the steps any educator can take to create a Project Based Learning environment in their classroom. From the traditional teacher designed projects to student created projects, this session will provide guidance and examples on how to help students get the most out of your class. 3D Design with Tinkercad - This session will cover some of the basics of 3D design using the free web-based tool, Tinkercad. 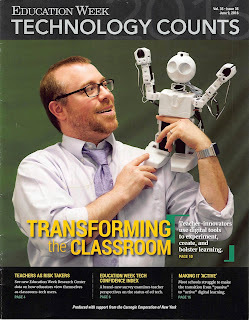 Teachers will need a laptop and some imagination as they take an idea and create a 3D model. This session will show teachers how to sign up for an account, create 3D objects, upload to a 3D Community (Thingiverse), and brainstorm lessons that can incorporate 3D design. 20 Time: Creating a Genius Every Hour - Are you ready to take project based learning to the next level? 20 Time, AKA Genius Hour, is the program you are looking for to let your students explore the things they are most passionate. This session will guide teachers through the set up and implementation of Genius Hour. This session will also have examples of student work and collaboration time so teachers can leave the session ready to implement 20 Time in their class ASAP! Ready, Set, Make - This session will explore the value of Making in schools. Teachers will have an opportunity to explore many different aspects of a Makerspace and see student created projects. Tools that can be found in a Makerspace will be discussed and many links and examples will be shown to give attendees a good feel of what a Makerspace can look like in their school. Also, you can't have a Makerspace session without making, so teachers will have some time to explore their creative side and Make something awesome. Digital Tools to Support Reading and Writing: In this sessions, attendees will get an overview of different tools they can use in their classroom to engage students in the reading and writing process. From the uses of social media to great online tools, teachers will see examples and be given time to collaborate and discuss on the different ways these tools can be used in their classroom. Get Your Head in the Clouds: In this session, attendees will be shown different Cloud based tools that can help them streamline their work and increase student engagement in their classroom. The cloud is not vanishing any time soon and it is important for teachers to explore this growing area of technology to better prepare students for the world they are entering. Google Apps for Education - Attendees will be able to use Google Apps in this session and walk away with a new view of using different tools to enhance the learning experience in their classroom. Using these tools requires hardware and software, so a session that focuses on these tools is best served as a workshop where all of the tools can be ordered in advance so attendees can learn about them and take home their own kit to continue the learning. Here is an example of a Keynote and an Ignite session. If you are looking for a dedicated educator to help your district, conference, or company, please contact The Nerdy Teacher LLC. "The views expressed on this site are my own and do not reflect the views of the school district I currently work."